St Petersburg, Florida | So Many Exciting and Beautiful Places! ← Even a Foggy Day is Beautiful! We flew from Pensacola to St. Petersburg this afternoon, and arrived at our hotel, The Vinoy Renaissance Hotel mid-afternoon. This hotel was built in the 1920’s and is listed on the National Register of Historic Places. It was recently renovated, but retains its original architectural style. It is situated in the St. Petersburg arts district, and celebrates that identity as well. When you enter the front door, the first thing you see is a stunning Chihuly glass display. Dale Chihuly display in Vinoy lobby. After settling in, we met other members of Mark’s family at the Park Shore Grill across the beach drive from the hotel. The family is here for an annual bottling meeting. No scheduled activities until tonight, so we did some exploring. There are several art galleries and restaurants along the beach drive, all within easy walking distance of our hotel. There is a permanent display of Chihuly glass just across from the hotel. Tonight, we gathered with the other bottlers for a buffet dinner on the hotel grounds on a balmy evening. 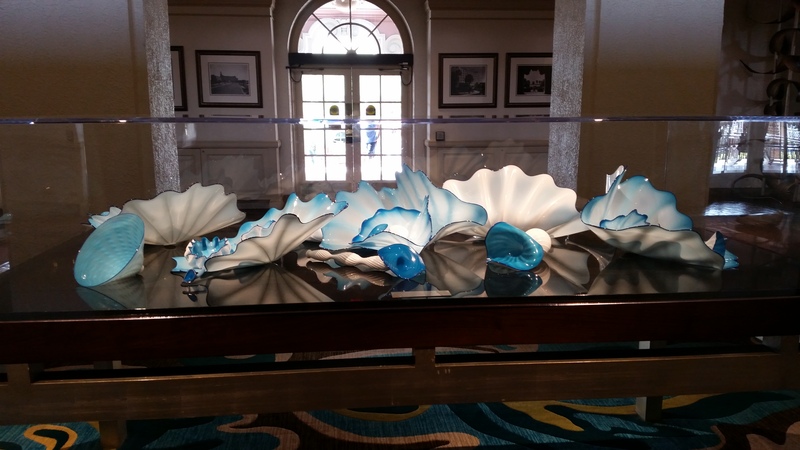 This entry was posted in Florida, USA Travel and tagged Dale Chihuly. Bookmark the permalink. Enjoy your stay! St. Pete is a great city to explore!! Thanks. We certainly are so far.